Owners of woodlots learned how to generate more income from their properties in a recent workshop, “Diverse Income Opportunities on Small Woodlands,” sponsored by West Multnomah Soil and Water Conservation District (WMSWCD). The event drew more than 75 participants, including approximately 55 landowners from Multnomah, Washington and Columbia counties, who came away with innovative ideas to capture more economic value from their woodlands. Northwest Certified Forestry Director Ian Hanna explained sustainable forest certification programs, which open a range of new market opportunities for “green” wood. Mike Gaudern, of the newly formed Woodlands Carbon Company, talked about carbon markets, noting that annual growth on 110 acres of woodland on the west side of the Cascades, for example, could generate from $600 to $2,800 per year in carbon sequestration credits (based on market values at the Chicago Climate Exchange last year). Gaudern’s group pools carbon credits for small woodland owners to sell as carbon offsets to polluters or carbon consumers. Carbon consumers may range from large energy facilities to individuals and companies looking to offset their carbon footprint from commuting or other travel, for example. 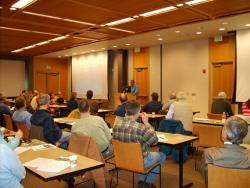 A series of speakers provided an overview of incentive programs and other assistance available to forest landowners. Mike Bondi, OSU Extension Forester, explained that OSU partners with groups such as the Oregon Small Woodlands Association or WMSWCD to host workshops and train landowners to be master woodland managers or master gardeners, for example. See www.cof.orst.edu/cof/ extended/extserv/ for more information. Steve Fedje of the USDA Natural Resource Conservation Service reviewed federal Farm Bill cost-share programs that support forestry. Both the Environmental Quality Incentives Program (EQIP) and the new Forest Reserve Program (FRP) will share costs with landowners to restore forestland or keep working woodlands forested. The latter program will launch in Southern Oregon with a focus on spotted owl habitat; it is hoped FRP will expand to include Multnomah County. Kammy Kern-Korot, Rural Resource Specialist with the WMSWCD, explained the agency’s free technical assistance to forest and other rural landowners, and access to incentive and grant programs, including WMSWCD’s FISH and CARE grants, monies available to improve wildlife habitat and implement conservation plans, including those on forest lands. CARE could help a landowner pay a consulting forester or engineer, for example. For information, contact Kern-Korot or Scott Gall at 503-238-4775 or visit www.wmswcd.org. How to tap new markets for wood products was the topic led by Peter Hayes of Hyla Woods; he explained how he developed on-site processing of wood products, in the form of a solar kiln, and finding niche markets. Hayes is on the Oregon Board of Forestry and is a voice for small woodland owners at the statewide policy level. Chad Davis of Sustainable Northwest and Tom Nygren of Oregon Woodlands Cooperative talked of building niche markets, a local distribution warehouse, and higher revenues for high-value wood from small woodlands. Pilot projects involving cultivation of mushrooms and production of medicinal extracts are underway. Both can add value to woodlands. By the end of the daylong workshop, participants and presenters was energized and excited to explore opportunities for collaboration, and to create or renew a forest management plan. There was a robust discussion regarding the potential for shared ownership of processing facilities such as a kiln or small mill in West Multnomah County or neighboring counties and/or collective timber harvest and cooperative forest management. One idea is for WMSWCD to work with local landowners, woodlands cooperatives, and ODF to develop a landscape-level forest management plan and processing infrastructure and high-value market outlets.